ASSP stands for Anti-Spam SMTP Proxy and that’s exactly what it is. You install it as a proxy between the internet and your mailserver and it filters out spam for you. For more information on ASSP check out my previous article on ASSP, which is much more verbal and also discusses in some detail how to operate your ASSP installation. This article explains how to set up ASSP on Debian 8 “Jessie”. It will most probably work on any Debian derevative as well, like Ubuntu or Linux Mint. Update: added notes for installing on Ubuntu 16.04.1. Ubuntu doesn’t have aptitude installed by default so if you’re running Ubuntu you must either install it (# apt-get install aptitude) or substitute aptitude for apt-get in this article. We’ll start out with text files and migrate to MySQL once everything is running. You will need to set up your own mailserver (e.g. Exchange, Domino, Postfix) and have it relay outgoing mail through the ASSP server. We’ll set up ASSP on a separate machine. It’s perfectly possible to run ASSP on your mailserver itself but isolating it on a separate machine makes for easier troubleshooting. During setup ASSP may complain that it needs at least four processors and two DNS servers. It will work with less but the complaints are valid: in order to secure smooth operations you *will* need a decent server. Also the DNS servers need to be servers on your LAN, not on the internet. External DNS servers may return non-standard replies to dnsbl queries and even if they don’t they may start doing so in the future without warning. For this test setup I’m using just one DNS server but in a corporate environment in which you’re depending on DNS for your daily network operations (say Active Directory or any type of LDAP based network) your DNS server(s) must be sufficiently responsive to service both LDAP and ASSP queries. Why not use Exim4 instead of Postfix? Because I am more familiair with Postfix. Use Exim4 if you like. Do keep the IP addresses in mind when copying and pasting example code into your own server. 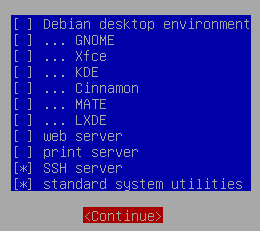 When installing Debian you’ll be asked which server roles you would like to install. Ubuntu and other derevatives may differ from Debian itself but in any case you do not need to select anything in particular. SSH will be handy and the so-called standard system utilities. Note for Ubuntu 16: you may install the Mailserver role here, which will install Postfix. If asked to replace Exim, choose Yes. Type of server: Internet Site. System mail name: like the explanation on-screen says: if a mail address on the local host is foo@example.org, the value would be example org. We need to take a careful look at the maximum allowed e-mail size because if ASSP and Postfix are not using the same size strange errors may occur. I have had mails stuck in the queue indefinitely because Postfix’s maximum size was smaller than ASSP’s. For this article we’ll be going with a 20MB e-mail limit. Take care to use your own server’s address in the above line where I wrote 192.168.1.2. – to use a hash of the file /etc/postfix/transport to look for routing instructions. If you don’t do this Postfix will assume it is the final recipient of incoming mail for your domain, which it isn’t: it must be routed through ASSP and delivered to your ‘real’ mailserver. This tells Postfix that mail to the example.com domain should be routed to 192.168.1.3 using the smtp protocol. Again, use your own domain name and mailserver IP address. The postmap command creates a hash file for the /etc/postfix/transport. Our file contains only one entry but if there a lot more the hashing would make it easier to read for the computer, thus faster. It’s just the way Postfix does things. Note that if you change the transport file you need to rehash it by rerunning the above postmap command. We’ll be installing as many Perl modules as possible from Debian’s repositories. This ensures they will play nice with the rest of the OS and be updated automatically. Some modules have dependencies that need to be fulfilled first. Some Perl modules are not available as a Debian repository package. We need to install those with CPAN. Now let’s install the modules. This may take a while. Get coffee. LWP will ask if you want to run tests. Answer it No. Get more coffee. Mail::SPF::Query is used for upgrade compatibility with ASSP V1. V2 only uses Mail::SPF. It is possible to force install Mail::SPF::Query and it will work but unless you’re upgrading from V1 (which we’re not; this is a clean install) it is better to disable useMailSPFQuery, not install Mail::SPF::Query and instead enable useMailSPF and install libmail-spf. Enabling and disabling these options can be done in ASSP’s web interface later on. Extract to /usr/share/assp/. You could put it anywhere but I’m using this path. ASSP will change the permissions a bit. That’s ok. It’s started as root and its code changes it to the assp user. Press Ctrl + C to fork the process to the background to free your console. Watch for errors and warnings in /usr/share/assp/logs/maillog.txt. Point your browser to http://192.168.1.2:55555. The default username is root and the password is nospam4me. Use at least two dns servers for production environments. Using one dns server will result in an error message ‘incorrect ‘DNSServers’ – possibly unchanged’. It will still work. Do not forget to press Apply Changes after making changes. If you need to restart ASSP scroll all the way up and click Shutdown/Restart. Click the Proceed button and be patient. You can follow the shutdown process from your terminal. If your browser says the page cannot be found ASSP has stopped and you may restart it. Now is a good time to test connectivity. Tell your mailserver to relay outgoing mail to 192.168.1.2:225 and verify that incoming and outgoing mail is working. In case of problems check /var/log/mail.log and /usr/share/assp/logs/maillog.txt. The installer will ask you for a password. Choose a hard password and remember it. Enable [Network Setup / Incoming Mail] > Disable all new SMTP and Proxy Network Connections (DisableSMTPNetworking). So check the checkbox. Initially this will not show any output because ASSP has not made any tables yet. [Apply Changes], verify that ASSP is not throwing errors and that the database settings remain set in the web interface. Restart ASSP and verify that the watch command now shows the whitelist table (can take a few seconds). * Subscribe to the ASSP mailing list. – ASSP logs to /usr/share/assp/logs/maillog.txt and /usr/share/assp/logs/bmaillog.txt (errors). That is, if you installed ASSP in /usr/share/assp. – Do not start the line ‘125 inet n – – – – smtpd’ with one or more spaces. – Postfix does not care about the order of the directives in main.cf. * Check my previous article on ASSP for a more elaborate discussion of the software. Tx very much for this howto! Did you install xpdf, tesseract-ocr and imagemagick first? I checked it: they are installed. Hmm, I’m not sure why that happens, sorry. This module is for splitting large (not sure how large exactly) pdf files. Try force installing it, completing the setup, then sending a very large pdf file and check the log files. Perhaps it is related to the previously failed OCR modules. Make sure those are installed, leave cpan, try again. It that doesn’t help perhaps the Perl Monks can be of service. Have you ever tried to manage the ASSP part with Puppet ? OK, I’m checking this out and it seems that packaging the CPAN modules would be best, even for normal installation. Do you have an opinion here ? I also struggled getting the perl mysql DBI to work and this command helped get it installed. sudo apt-get install libdbd-mysql-perl . If you want to use the cpan verison you need to create a DB user with your username and then with a password of skr1t or something like that. I really enjoyed reading your mail server tutorials and I have successfully setup a mail server (Dovecot+Postfix+ASSP). However I have one problem: ASSP is doing it’s job fine with incoming mails but I don’t manage to the same for outgoing ones. I fail to understand how relaying works in the case of all services running on one box without the need of two instances of Postfix. I managed that ASSP is reading the outgoing mails just fine but then is relaying to postfix, postfix then does the same and sends it back to ASSP and I end up with mails being bounced. I am new to mail servers and I really have difficulties to make the relaying properly work with ASSP. If you are new to mail servers then I compliment you on how far you’ve got :) I haven’t been able to succesfully set up all those components on one server myself. I suppose it is possible because noone’s forcing you to use one port or another and certainly Postfix allows for that kind of routing of mail – BUT: you really need to understand what you’re doing instead of just copying configs from a tutorial, otherwise you risk screwing up your config next time you try out something or install an update. You need to be able to troubleshoot. After pausing the project and thinking about it a little more, I come to the conclusion that IF I want to run everything on the same machine, I end up with two instances of ASSP. I have successfully told Postfix to relay outgoing mails to ASSP and ASSP is also checking them, but ASSP also wants a relayhost. I set as relayhost the postfix adress and ofc that will end up mails being bounced back and forth between postfix and ASSP. Basically I wanted is that clients can report spam by themselves and I havn’t thought I end up spending so many times hehe. But nonetheless I could learn a lot (relaying). Thank you again for your great tuts, keep up the good work! Yes, two Postfix instances. I came to the same conclusion. Possibly you could use the same Postfix instance with different relaying rules but in either case it gets messy. It looks like libgd2-xpm-dev has been deprecated. I changed it to libgd-dev instead and that seemed to fix it. I got this error when i sent mail to gmail. I had the spf, dkim, dmar on my domain but when email was relayed by assp, it got error.